Learn more about the Labrador Retriever. 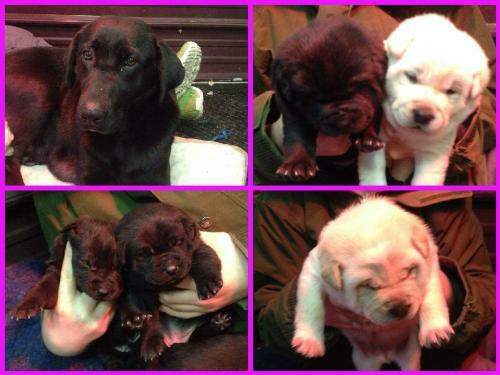 Lab Family - Need Fosters needs a caretaker or foster! Won't you consider helping him/her get a new start? Print an adoption flyer for Lab Family - Need Fosters! About Me: This momma lab and her puppies are looking for a new beginning. Momma is a sweet, small, gentle girl at only 35 pounds. They do not need to be adopted together, but are looking for a temporary foster home until the puppies are 8 weeks old, and then forever homes of their own. Currently we do not know if Lab Family - Need Fosters will be able to attend the event, Adoption Event on Sunday, April 5th, 2015. Currently we do not know if Lab Family - Need Fosters will be able to attend the event, Adoption Event on Sunday, April 19th, 2015. See Lab Family - Need Fosters's attendance information for future events.